Drama naturally lends itself to a neat three-act structure. At the most basic level, it’s as simple as beginning, middle and end. 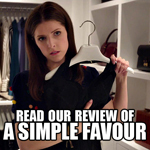 However, it’s also a format taught in just about every screenwriting course, and it’s even used as the conventional model for those with more innovative approaches. With that in mind, it’s interest that Star Trek has done relatively few three-part stories. The Circle sits in the middle of the first such attempt, in the second season of the second spin-off. The format would not see use again for over a decade, when it would become a feature of the final season of Star Trek to air on television. Given the franchise is relatively fond of two-parters, it seems strange that there haven’t been more attempts to extend that out an episode. Perhaps the reason is obvious. Of the three acts, the beginning and the end are the most essential. Both come with a certain in-built amount of energy. The first part introduces the problem, while the conclusion deals with it. However, it’s the middle which proves problematic. It’s the point in the story after you’ve set up the conflict, but before you resolve it. Given how much difficulty Star Trek: The Next Generation had with conclusions, imagine how difficult the second part of a three-parter would be. Even when Star Trek: Enterprise adopted the three-parter format it ran into basic structural difficulties, with a couple feeling like a two-part episode with an additional prologue or epilogue added on. The Circle isn’t a terribly flawed piece of television, but it suffers from the fact that Star Trek has never really tried storytelling in this mode before. Again, what I really like about these three episodes is the space given over to character development. I’m not sure there’s enough material in this plot to sustain three full episodes (although there is more than I’d advise cramming into two). So the difference is made up with character moments. The Homecoming gave us a little interaction between Sisko and his son to contextualise the growing divide between Bajor and the Federation. The Siege gives us some nice character stuff in the first act. The Circle, however, gives us an absolutely lovely scene in Major Kira’s quarters. Apparently it was filmed in one long take, with close-ups and reaction shots edited in afterwards. 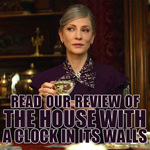 It’s remarkable, because it features so many cast members present at a given moment acting in a way that has to convey the script’s point, but still seem organic. The way that the actors move through the scene and converse across each other in a way that remains clear and easy to follow is one of the signs of a strong ensemble. I like the fact that the show makes Kira’s departure a big deal. We know she’s not gone. 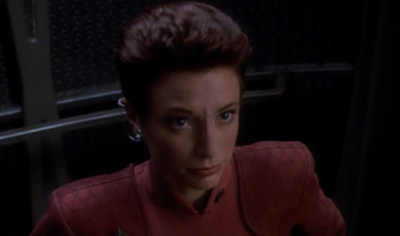 Nana Visitor’s name was still in the title credits, and even though Star Trek had only gotten rid of one regular cast member at this point, you get the sense that they aren’t going to jettison their secondary lead at the start of the second season while keeping her in the opening credits. When Kes hung around Star Trek: Voyager for two episodes at the start of the fourth season, she was pumped out of the main credits and emoted to guest star. When Ethan Phillips departed the show a few episodes before the finalé, his name remained in the credits. So we know that Nana Visitor probably isn’t going anywhere. The handy “to be continued…” notes at the end of The Homecoming and The Circle only serve to reassure that her departure is a change for the story rather than for the series (or even the season). Still, the fairwell scene is quite nice. Colm Meaney’s O’Brien is particularly adorable when he steps into the middle of a heated debate simply to wish her the best of luck, while Bashir looks flabbergasted by what is going on. Already the relationships on the show seem strong. Odo and Kira have been established as two of the closest colleagues on the show from A Man Alone and Past Prologue, depending on whether you’re going by broadcast or production order. Their relationship only strengthens as the show goes on, but it feels appropriate that Odo is the character with the strongest reaction to Kira’s departure. And it’s perfectly in keeping with the character that his objections are based more on his personal conception of justice than on any set of codified laws. “Major, you’ve been breaking one too many for fourteen and a half years,” he protests, flying into full on “conspiracy theorist” mode. “Cardassian rules, Bajoran rules, Federation rules, they’re all meaningless to you because you have a personal code that’s always mattered more. And I’m sorry to say you’re in slim company.” That’s one hell of a compliment, and I’m surprised that Kira seems to miss it completely amid all the confusion. Odo’s attraction to Kira would be properly established in Necessary Evil, but it seems like a logical extrapolation from what we know about them. 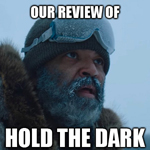 Ironically, despite this strong work, the biggest problem with The Circle also stems from its characters. Quite frankly, and it seems like an odd remark to make about a trilogy centred around a Bajoran civil war, too many of the guest stars seem nice. To be more precise, too much screentime is devoted to supporting characters who seem generically nice, as the episode seems to bask in their inherent (and incontrovertible) niceness. The most obvious is Li Nalas, the returned hero from The Homecoming. 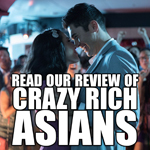 I actually respect the decision to cast Li as a nice guy. Given that he’s introduced as a potential replacement for Kira, it would be too easy to reveal he’s secretly either a spy or a douchebag. Making him an informer for Jaro might make sense on a plot level, but it would seem contrived and overly-simplify both the plot and the narrative.It would make it too easy to brush him aside so Kira could return and we could all be one big happy family again. It would also have been tempting to take the character’s defining characteristic – the over-hyped heroism he so clearly resents – and push his personality firmly in the opposite direction so as to generate contrast. The story of Li Nalas the war hero is particularly striking if he’s a weak-willed coward. However, the show refuses to indulge in that cliché either. He delivers a pretty badass leadership speech early in The Siege. Here, he take part in the rescue of Kira. Li Nalas might not be the man of legend, but he’s not a coward or a fool. And I like that the trilogy avoids that sort of characterisation, even if it would have probably helped the character arc flow better. Making Li a decent guy might have been a pleasantly original decision, but it does curtail the storytelling opportunities for the guy. 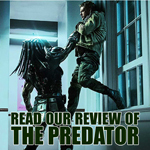 It makes it harder to make him especially interesting, and makes it tougher to provide him a clear throughline over the trilogy. He starts as a decent guy, he continues as a decent guy, he dies as a decent guy. It’s hardly the stuff of enduring television. The episode also reintroduces us to Vedek Bareil, who last appeared in In the Hands of the Prophets. However, he’s somewhat less of a well-rounded character here than he was there. While he never seemed like a fully-formed character, at least In the Hands of the Prophets suggested that Bareil was much a shrewd political operator as a zen master. Here, he seems to have been slightly simplified, perhaps reflecting Philip Anglim’s somewhat stoic portrayal of the character. He becomes a font of generic life advice, and seems as much interested in helping Kira as he does with anything concerning Bajor or his own place in it. He flies up to the station, at the behest of an Orb vision, to invite Kira to hang out with him. “Do you have any immediate plans?” he asks. “Perhaps I have the perfect solution. Come and stay at our monastery for a while. It can help when the spirit gets a little bruised.” It just feels rather generic. It might be possible to add some dimensions to the character by cynically suggesting Bareil is using his access to Bajoran spirituality as a way of picking up girls (hey babe, wanna see my Orb? ), but Anglim’s somewhat bland portrayal can’t really support that. The closest we get to a genuinely creepy “Kira is staying with a strange and unreadable man she doesn’t really know” moment comes when she observes, “You don’t know me.” Slipping into a mood that’s either insanely bored or downright creepy (or maybe both), Anglim replies, “I’m beginning to.” He sounds more like a horror villain than a potential boyfriend. Still, it’s one exception to his general characteristion. Bareil is the kind of guy who you might describe as “a decent sort.” That’s grand, but it never really seems like he has the reserve of strength or political skill to make a legitimate claim to be Kai. That isn’t a problem, as that is what The Collaborator confirms, but it seems hard to believe he could have manoeuvred himself into the race in the first place. Indeed, Bareil is so bland that Kira has to offer her own obtuse zen philosophical observations about how her inability to properly put down stone reflects on her as a person. “It’s me,” she protests. “The stones are straight. I’m the one who’s crooked.” This puts a whole new slant on the self-help spiritual retreat. You can see the writers pushing Kira and Bareil together, turning Bareil into the first of Kira’s surprisingly boring boyfriends. They aren’t even subtle about it. The Orb vision features the pair naked together. To be fair, the writing staff would figure out Bareil was a troublesome character quite quickly, and he wouldn’t hang around too long. However, there probably should have been some early warning signs. For one thing, pushing two characters together “because their gods told them too” rather than because the actors share any chemistry feels like an obvious mistake. pairing off Kira and Bareil seems like a decision which is just asking for trouble. Deep Space Nine generally had a much higher success rate in depicting relationships than any of the other spin-offs, but it also made some impressive (and repeated) missteps. Still, there’s a lot to like here, once you get past the difficulties with Bareil and Li Nalas as characters. For one thing, this represents the first real look we’ve had at Kira’s religious views. 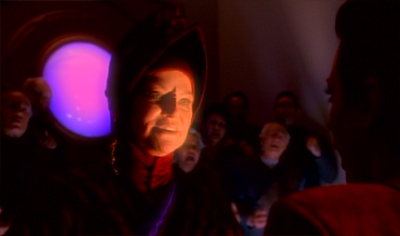 The Bajorans were established as a religious race in Emissary, and Kira’s faith played into the plot of Battle Lines as she was forced to abandon her spiritual leader in the Gamma Quadrant. Still, the character kept her work life so separate from her religious opinions that her admission she supported Vedek Winn’s fundamentalist philosophy in In the Hands of the Prophets came as the best kind of surprise: something which isn’t so outlandish that it doesn’t make sense, but something which would never have occurred to the audience. The Homecoming opened with Kira praying to what appeared to be an altar in her quarters. The Circle sees Kira going on a spiritual retreat back to her home planet, and even having a religious experience designed to help her look into the eyes of her own gods. “All my life I’ve dreamed of this,” she tells Bareil as he brings her to the Orb. 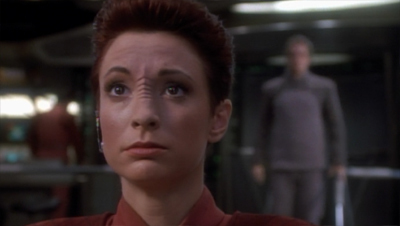 Nana Visitor sells it well enough that it’s convincing, and it’s not inconsistent with how we see Kira, but it’s weird to see such reverence from a character who spends so much of the show arguing against authority. 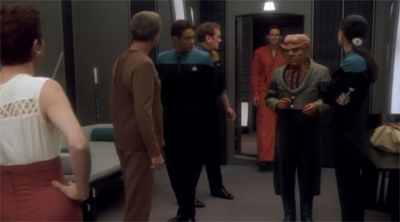 Then again, the beauty of Deep Space Nine was the way that it layered characters. Despite the fact that Kira doesn’t allow her religious faith to influence her role on the station, it is very much a part of her character. Despite her pretty bleak life experiences (or perhaps because of them), Kira seems to be a character predisposed to believe in other people. She invests various characters with more faith and trust than they necessarily deserve. 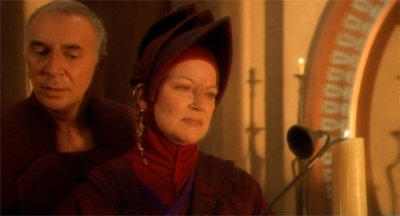 She believed in Vedek Winn as a force which could potentially unite Bajor. As such, her relatively short exchange with Winn at the end of In the Hands of the Prophets suggests severe betrayal. Indeed, Kira seems to grow to hate Winn even more than Sisko or any of the other regulars. Here, she believes that Li Nalas has the power and charisma to unite Bajor. While her faith in li is not so dramatically misplaced, he gets assigned to a space station and does nothing beyond seeming like a pretty nice guy. It fits Kira’s character surprisingly well, this idea that she’s actually surprisingly naive once you get past her tough exterior. It isn’t even that she believes blindly – she only needs to encounter Winn once to see the Vedek’s true colours. It’s that Kira very clearly wants to believe. In a way, Kira speaks quite well to that mid-nineties philosophy, similar to that seen in Mulder on The X-Files, the notion that it isn’t belief in a particular thing which gives us strength (indeed, in the case of Winn and Jaro, it makes people dangerous), it’s the willingness to believe at all. 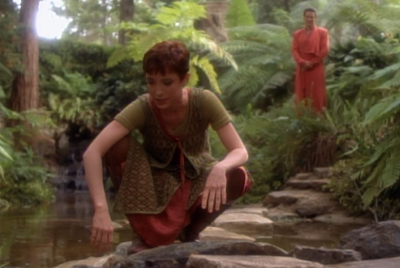 The Bajoran faith as presented shows little evidence of being a personal one. The Prophets, too, are always spoken of collectively. 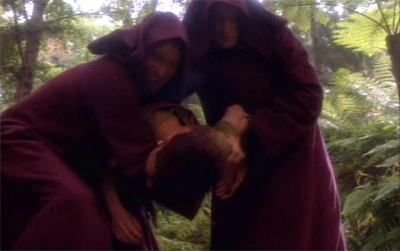 Although it is said that the Bajorans worship the wormhole aliens as Prophets, we rarely see them doing so. 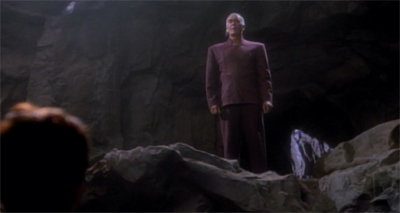 Apart from a scene at the opening of The Homecoming, where Major Kira appears to be involved in a ritual act before a private altar, it is not until Accession that there is strong evidence of regular worship. Later, in Ties of Blood and Water, Major Kira is seen to pray. Other facets that we might expect to see in a religion are more clearly absent. There is, for example, no creativity attributed to the Prophets. Nor is there any soteriology. There is, in fact, little reason given for the Prophets to be worshiped. 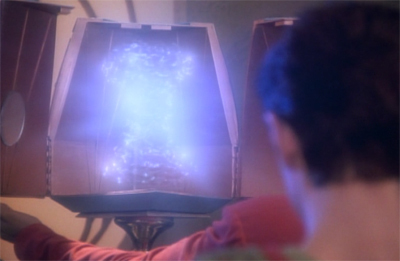 It is never said, for example as it might be (although it is once implied), that upon a Bajoran’s death he is taken to the Celestial Temple, as the Bajorans regard the wormhole. The content of Bajoran prophecies is rarely discussed. When it is they appear to be prophecies in the most literal sense. 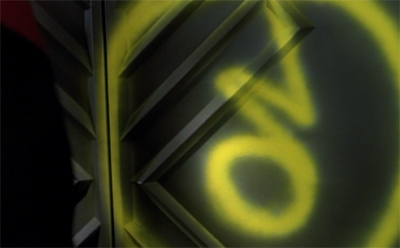 The opening of the wormhole is foretold, as are Cardassian experiments with it. The prophecies do not seem to offer moral teaching, myths, or eschatology. There is a temptation to write this off as an error on the part of the writers, an inability to give the Bajoran religion the necessary texture to appear fully-formed. However, such a view undeniably conforms to Western models of worship and religious practice. It seems entirely reasonable that an organised religion on an alien world could exist in a form which does map perfectly to our expectations of structured worship and religious teaching. Sheilaism has prompted much fear among religious leaders, yet her story is not unlike those of many women who are struggling with their own identities and seek liberation from the constraints of organized religion. My research suggests this outlook is actually quite widespread among the large baby boom generation (Roof 1993). It occurs not just as a spiritual struggle for women, gays and lesbians, and other minorities, but also among those who – as is very common among young people – have weak ties with a religious tradition, who have been raised in non-practicing or non-observant families, or who are born into mixed-faith families. For some, privatized religion results in a greater religious self-understanding; and for others it amounts to a weakening of faith altogether. 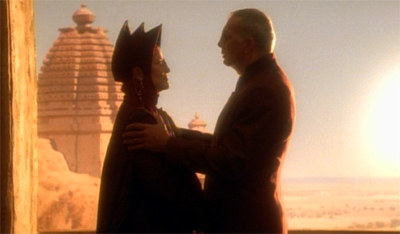 As such, the modern Bajoran religious structure, where Vedeks seem to serve more as religious scholars than priests and people seems free to worship in their own way with a minimum amount of direction, perhaps holds up a mirror to contemporary American belief systems. Indeed, this perfectly encapsulates the show’s approach to faith. 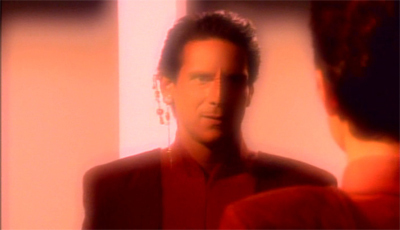 Religious belief, according to Deep Space Nine, can be a deeply fulfilling part of a person’s character – a defining component of an individual’s identity. (In fact, even Quark seems to subtly adhere to his own religious system, aspiring towards “the Divine Treasury”, which is arguably less restrictive than the regulations of the Ferengi Commerce Authority.) It’s only when that faith becomes restrictive or overly ritualised that it presents a problem. In Ascension, for example, attempts to return to a caste system of Bajor and to implement dogmatic religious regression on Bajor are treated as incredibly damaging to Bajoran society. It’s no coincidence, then, that Vedek Winn is portrayed as a candidate who stands, according to Jaro, “for a return to orthodox values.” Winn’s teachings were established in In the Hands of the Prophets as fundamentalist and traditionalist – uncompromisingly dogmatic. So it’s no surprise that Winn’s attempts to ascend to the position of Kai should be presented as a very bad thing. While Winn’s rise to power is as much a result of her unwavering selfishness and ability to rationalise anything as for her perceived greater good, the show allows her to hold on to her faith. It does seem that she believes at least some of what she teaches, even if she’s hypocritical enough to throw allies and followers under the bus the moment they become a hindrance. The irony, of course, is that Winn’s dogmatic belief expressly puts her further from her gods. We discover in The Reckoning that the Prophets have never spoken to here. That might explain her desperate need to please them, and her desire for a firmer religious orthodoxy – by imposing the “old ways”, Winn can lead the people closer to their gods without actually having to engage or converse with those gods. For somebody who has been continually ignored and overlooked by the Prophets, implementing a series of tighter controls would allow her to at least seem closer to them. Ironically, this then pushes her further away from the true philosophy of the Prophets. The Prophets are always pretty ambiguous, but they do eventually seem to care for Bajor, based on their actions in the sixth season. Their favouring of Sisko seems to suggest they want a progressive forward-looking Bajor. It’s also interesting to contrast the relatively benign and free-spirited Bajoran religion to other portrayals of religion in Deep Space Nine. The Jem’Hadar, for example, worship the Founders much as Bajor worships the Prophets. However, unlike the Prophets, the Founders are wrathful and vengeful gods who belief in punishing the unbelievers and ask their followers to lay down their lives for the goals of the Dominion. It’s telling that the Jem’Hadar belief system is more strictly ritualised than that of the Bajorans. There are large group ceremonies for the mere act of consuming ketracel white, the drug used to keep the Jem’Hadar in line. There are rituals observed before battle, where the Jem’Hadar suggest their lives have already been given in service to their gods. They simply fight so that they may earn them back to offer them again at a later date. The Jem’Hadar religion is more rigidly defined than that of the Bajorans, but it is also more unquestioning. While Vedeks seem to exist merely to ponder existential riddles, there are no Jem’Hadar theologians. Jem’Hadar faith is blind and unquestioning, and it is the justification for terrible things. 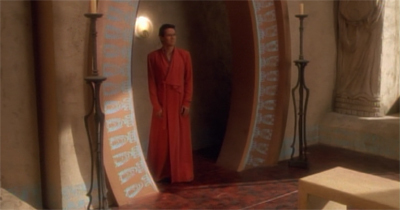 It is more like Winn’s religious outlook than that of Kira or Bareil or any of the other major Bajoran characters. Star Trek has been generally quite atheist, but Deep Space Nine seems to acknowledge that religious belief is not inherently good or bad – it is how that belief is harnessed which tells. It’s a thoughtful and considerate philosophy, and one more even more pertinent today than it was when the episode was broadcast. Of course, The Circle echoes for other reasons. For one thing, the situation on Bajor reads almost as a prescient commentary on American involvement in Iraq and Afghanistan. The Federation has often been a stand-in for American cultural values and norms, and those other races in Star Trek frequently represent the various threats challenging America. The Klingons and the Romulans were Communists in the original Star Trek, for example. The Xindi from Enterprise were terrorists. The Bajoran people can be metaphors for anything. As an oppressed people, they’re so effective an archetype that they can fit almost any model. Are they the Jews persecuted in the Holocaust? Are they the Irish suffering under British rule? Are they the Palestinians? Are they any number of former colonies struggling to define themselves in a post-colonial world. 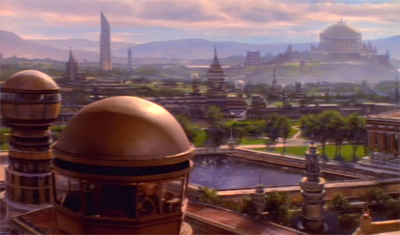 The show has established that Bajor was once a centre of learning and knowledge. Here, Jaro argues, “We are a people who brought art and architecture to countless planets. We don’t deserve to be victims.” In a way, perhaps, it invites comparisons to the major role that the Middle East played in the Renaissance, as a centre of learning and culture. Sadly, the modern political instability in the region is all the more tragic for the importance it once had as a bastion of knowledge and reason. That said, the comparison isn’t particular to the situation in Iraq or Afghanistan. There are obvious similarities, down to the link between the xenophobic extremists and hard-line religious figures, but The Circle resonates with these as only the most obvious and high-profile examples of a familiar political pattern. The Circle is hardly predicting future events. It’s just recognising that certain realities and eventualities tend to play out following a massive sociological shift. The current crises in Iraq and Afghanistan are rooted in the removal of dictatorial regimes. The descent into instability and violence is not unprecedented. The Circle seems to be drawing from the history of many former colonies granted independence. Often independence from a colonial power will be followed by a civil war. 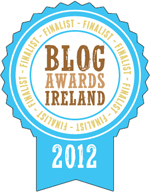 Ireland engaged in its civil war almost immediately following the War of Independence. The Congo Crisis led to the death 100,000 people following Congolese Independence. This isn’t an example specific to one continent or time. When an empire comes to an end, it invariably leaves a series of vacuums behind it. In the Africa of the 1960s and 1970s, not one but four European empires – those of Belgium, Britain, France and Portugal – came to an end, and so it is hardy surprising that the continent has suffered from a series of political and power implosions. It is the need to fill these vacuums that lies at the centre of much of the violence that has troubled Africa over the 50 years since 1960. Given that Deep Space Nine has devoted so much time to post-colonial thought, it makes sense for the show to deal with a potential Bajoran civil war. And this is a potential civil war. 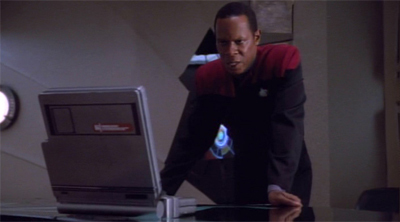 “Every time there is a potential confrontation,” Sisko notes, “the military withdraws to a safer position.” Krim points out that he can’t view the military situation with the same dispassionate eye as Sisko. “You can’t possibly appreciate that this is Bajoran against Bajoran.” Sisko then makes an observation which any historian with an interest in post-colonial governance will find quite astute. “I can appreciate that the provisional government will stand only if the military supports it.” How true that is. Like a lot of this trilogy, that fact seems well-observed, and supports the argument that Deep Space Nine is truly post-colonial Star Trek. And civil wars don’t happen in a vacuum, despite what the name implies. All that matters is the scale of outside interference. Winston Churchill loaned the Irish Free State artillery while tensions escalated in Dublin. There’s some suggestion some personnel may have been covertly assigned over. The United States got involved in Korean and Vietnamese civil wars. Britain and America covertly assisted in internal revolutions in several Middle Eastern countries. Here, the Cardassians are meddling in Bajoran affairs for their own ends. It’s a nice touch – the idea that the Circle are being armed by their worst enemy with an endgame which doesn’t necessarily overlap. 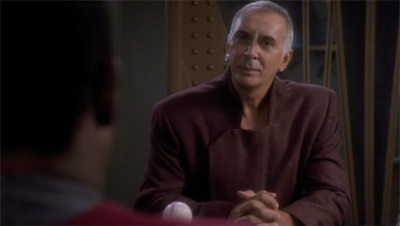 However angry Jaro might be with the Federation, one assumes he’ll be even less happy with the Cardassians returning. There are competing motivations here, which just happen to align in this particular way. 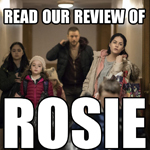 It’s a very organic and nuanced depiction of the type of political quagmire involved in a situation like this, especially given the limited time afforded. In fact, the best thing about The Circle is how quickly things get out of hand. 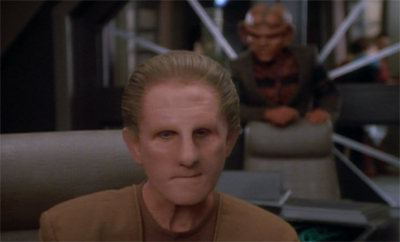 “It’s over, Odo,” Quark assures his old nemesis. “Everything. Bajor. The provisional government. The Federation being here. All of it.” This is a new kind of threat for Star Trek, one beyond even the high levels of “something nasty is heading towards Earth.” The stakes are different. They don’t involve Earth, but a fundamental threat to the show itself. It’s not just the risk to our lead characters, but the risk to everything they’ve worked for. Okay, we know that it’s probably not going to go belly up. The second season is not going to star Marc Alaimo as Gul Dukat and Frank Langella as Rebel Leader Jaro, despite how fun that might be. (I would watch that show.) 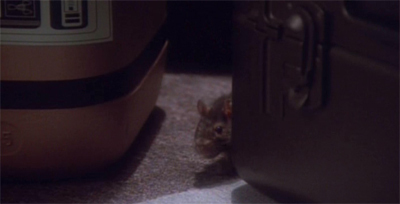 However, the stakes are high and the threat feels like it stabs right at the heart of Sisko’s mission. It isn’t just the threat of destruction, it’s the threat of watching a dream slip through your fingers because people are stupid and angry and scared. That’s something much less abstract than a race of cyborgs, but it’s also something quite powerful. By the way, Frank Langella is awesome, isn’t he? Jaro could easily seem like a simple moron who hasn’t really thought any of his actions through. Does he really think that the Federation withdrawal will keep the Cardassians away? It’s short-sighted, particularly for a man who fought for his planet’s independence. 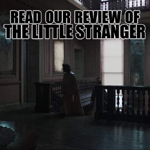 Jaro could easily seem like a shallow two-dimensional plot device, but Langella lends the character a certain amount of depth by the sheer virtue of being Frank Langella. Like Louise Fletcher, he is really good at what he does, and demonstrates how sharp the franchise’s casting could be in the nineties. This three-parter has a phenomenal guest cast. Even Li Nalas is much more effective than he might otherwise be due to Richard Beymer’s all-round likeability. The script is banal, but Beymer makes him seem like a guy who you wouldn’t mind buying a drink, even if he’d insist that he pay for it himself. 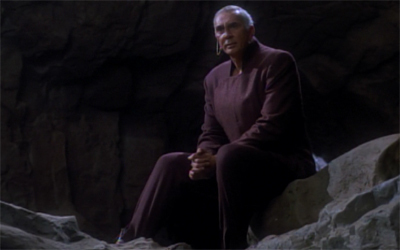 For his part, Langella exudes this larger-than-life calculating menace as Jaro. Jaro feels like the franchise’s first truly political animal, something made possible by stretching the show over three episodes. Tomalak seemed like quite a schemer in his Next Generation episodes, and Gowron showed hints of political awareness in his early appearances, but Jaro seems like a more shrewd manipulator. His objective is clear and his methods are effective. Jaro is more competent than Duras ever was, and his manoeuvring seems reasonably well-plotted. Deep Space Nine would go on to develop far more convincing political adversaries. Vedek Winn herself shows signs of growing into one here. 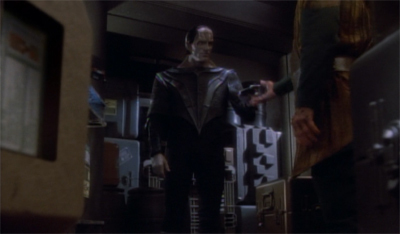 Dukat has yet to really come into his own, only sharing a set with Sisko in Emissary. We haven’t even met Weyoun yet. When Gowron eventually turns up on Deep Space Nine, the show is even more cynical about the guile it takes to rule the Klingon Empire. However, Jaro feels like something relatively new, an adversary who feels like a prototype for a new kind of Star Trek villain. And Langella does an excellent job. By the way, how crap is the Federation? Sisko has proof that the Cardassians are engineering a political coup on Bajor. How the hell can Admiral Chekote rationalise that as the kind of “genuine political revolution internal to Bajor” which would justify invoking the Prime Directive? At what point can the Federation intervene if another major interstellar empire is meddling in a planet’s affairs. One of the questions dangling over Deep Space Nine, raised implicitly by the first appearance of the Bajorans in Ensign Ro, is the question of what obligation the Federation has to protect the Bajorans. At what point does non-interference in mass murder become too much for a civilised people to tolerate? There are a whole manner of historical parallels. Most obviously, there’s the fact that the United Kingdom and the United States ignored reports of the Holocaust when it suited their interests to do so. Somewhat closer to this episode’s airdate, these same governments failed to intervene in the Rowandan Genocide, creating a guilt which still colours their involvement in the region. There’s no easy answer here, but it’s easy to condemn the Federation’s decision to just cut and run. We know that this will cost lives in the long run. Those lives won’t be Federation lives, they will be Bajorans. So to what extent is Starfleet obligated to prevent that? And at what point does trying to save those lives represent unjustified meddling? It’s hard to believe that Starfleet wouldn’t buy the necessary time to allow Benjamin Sisko to deliver the evidence to the Chamber of Ministers. After all, this isn’t asking for an investment of live. 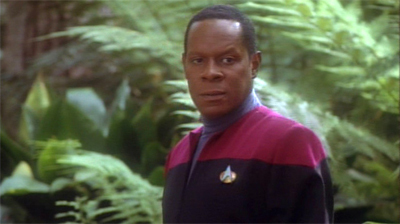 It’s just consent for Sisko’s plan and possible some muscle to buy time. This is, of course, entirely consistent with the Prime Directive as established on The Next Generation. (As distinct to the somewhat broader and oft-ignored-anyway version from the original Star Trek.) The only difference is that Deep Space Nine has the guts to suggest that Starfleet is simply hiding behind the rule to avoid making tough decisions and potentially risking Federation lives to protect alien interests. It’s not a high philosophical ideal, The Circle hints, but a selfish safety net. The Circle doesn’t work perfectly, but none of this trilogy do. However, it does broach some interesting questions about the world of Deep Space Nine, and ones which enrich the series as a whole. The Federation has often been a stand-in for American cultural values and norms, and those other races in Star Trek frequently represent the various threats challenging America. …which is somewhat ironic, given that the Bajoran religion resembles American spiritual fads. I think Deep Space Nine sort of copped-out of the question of the extent to which Bajor would have to change in order to join the Federation. The show sort of implies that the Federation needs to become more inclusive, but it also frowns on Bajoran “orthodoxy,” both social and religious. Can a planet that is still influenced by ancient traditions become a part of a thoroughly progressive Federation? 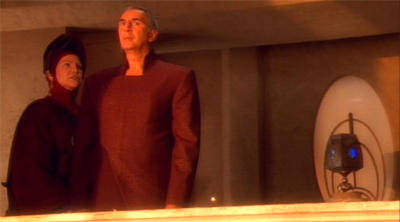 Should Bajor even aspire to unambiguous progressivism? If not, how can Bajor reconcile its orthodox factions to Federation progressivism? If so, isn’t the Federation being colonial and imperial again? One element I’ve always thought was left out of the Star Trek universe was human religion. I know; it’s a thoroughly secular and humanistic show, and I would never expect it to feature the traditional religions in its vision of the future. However, the Star Trek history just doesn’t seem to account for the death of human religion. The logical religious extrapolation from a progressive utopia would be ecumenism and non-theological spirituality. I think humans in the Star Trek universe should have some kind of “Theistic Assembly” or something. The only way that religion could have totally died out would be if religions were deliberately exterminated after the enlightenment following first contact. That would doubtlessly involve slaughtering massive numbers of people, which would end any claim to any kind of virtue for the Federation. I keep daydreaming that a new show based on the cast of the reboot movies would feature a preacher character in the mold Shepherd Book from Firefly, perhaps from some remote human colony where the inhabitants didn’t get the memo about the end of religion. I know it won’t happen, though. That’s a valid point about Bajor and the Federation, and I think you can really see the show trying to handle that towards the end of the second season, when you saw the shift from Michael Piller’s control to Ira Steven Behr. It seems like the end of the second season seems to realise that maybe the Federation’s approach could be seen as just as colonial and predatory as Cardassia’s. 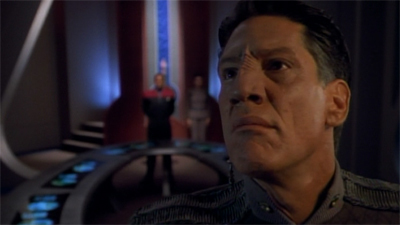 In The Collaborator, for example, Sisko seems like he’d be quite happy to embrace Winn as an ally if she’ll back the Federation (even though he stops short of directly meddling in the race for Kai), or – in The Maquis – Sisko realises that the Federation’s macro view of the universe can leave smaller colonies ont heir own, while Kira stares at him as if surprised it’s taken him this long to reach that conclusion. I think Behr and Echevarria argued that the show’s shift of focus away from Bajor towards the end of the second season was driven by the fact that the Bajor shows got low ratings. (The Collaborator certainly did, and Duet and In the Hands of the Prophets also have lower rating, but that’s by virtue of being the last two shows of the first season.) Part of me also suspects that the decision to drift away from the Federation’s interaction with Bajor was based on the colonial subtext. Behr’s last word on Bajor/Federation relations comes in the fifth season, where the show asserts the importance of Bajoran independence and never mentions membership in any real depth again.